The US has made important progress recently in advancing contributions to ITER diagnostic systems. More than 40 diagnostic instruments will be installed on ITER to provide detailed information about the plasmas, allowing the operators to optimize the machine's performance and meet ITER's goals. All ITER Members are supplying diagnostics to the project; the US is designing seven instruments plus four port plugs, which will provide shielded housing for the diagnostics. Contributions include x-ray, laser, microwave and optical systems. As of late October, eleven Procurement Arrangements had been signed with the ITER Organization detailing the design, procurement and delivery responsibilities for the US. Four support contracts were placed in 2014 to advance designs, and one instrument is already in the final design phase. The US ITER diagnostics team is based at the Princeton Plasma Physics Laboratory and works closely with the US ITER project office managed by the Oak Ridge National Laboratory. "Plasma diagnostics has historically been an area of US strength, and we are home to some of the inventors of diagnostic techniques appropriate for ITER," said David Johnson, team leader for US ITER diagnostics and principal research physicist at PPPL. General Atomics and UCLA (University of California, Los Angeles) are leading the physics design for the low-field-side reflectometer, which will provide primary measurement of the electron density spatial profile in the outer edge of the plasma. This diagnostic also contributes to determining the plasma pressure gradient that influences plasma stability and energy transport. ORNL is developing the transmission line components needed for this instrument. Palomar Scientific Instruments joins General Atomics and UCLA under contract to develop the physics design for the toroidal interferometer-polarimeter. 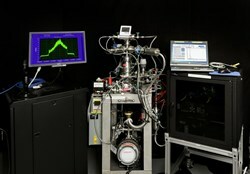 This instrument, which determines the electron density by probing the plasma with a carbon dioxide laser, will be used as a sensor in a feedback system to control various fueling sources. The electron cyclotron emission radiometer measures the spatial profile of the electron temperature in the plasma, a fundamental parameter for plasma behavior. The instrument provides time resolution adequate to serve in a feedback loop to stabilize predicted modes in the plasma. 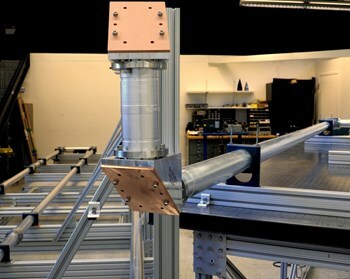 Three universities—University of Texas at Austin, University of Maryland and the Massachusetts Institute of Technology—are jointly developing the physics design, a calibration source, microwave sensors and analysis software. Infrared and visible cameras for viewing inside the ITER Tokamak chamber are now being developed by General Atomics, Lawrence Livermore National Laboratory and TNO, a Dutch laboratory for applied scientific research. This diagnostic will be used to look for parts of the ITER divertor region that are overheating. Oak Ridge National Laboratory is developing the residual gas analyzer. Now in final design, the instrument will measure the concentrations of neutral gases during a plasma discharge in the divertor exhaust duct and in the main chamber of the ITER Tokamak. The recently signed Procurement Arrangements cover two additional instruments. Experts at PPPL will develop the core imaging x-ray spectrometer, which will measure the plasma ion temperature and rotation. US ITER is targeting late 2015 for award of a contract for the motional Stark effect diagnostic instrument, which will measure the spatial profile of the current flowing in the plasma. In addition to diagnostic instruments, US ITER will also provide design, fabrication, assembly and testing of four diagnostic port plugs. The instruments view the plasma through labyrinths in these plugs, which also serve as radiation shields for the device. The PPPL team is leading the port plug design and integration effort. Because of the harsh environment inside the vacuum vessel, the instrument systems must cope with a range of conditions not previously encountered by diagnostic technology, all while performing with high reliability. The US ITER team is also supporting the integration of multiple diagnostics into these plugs, including some from other ITER partners. Read the original article on the US ITER website.